The Boo Roo and Tigger Too house is getting ready for a face lift. With the bedrooms first on the agenda, re-plastering, new doors and a lick of paint. So when Babyface offered me the opportunity to review some of their children’s bedding accessories I jumped at the opportunity. Just looking at Babyface’s about us page highlights how they have given though to what is important to both parents and children. ‘We know that a gorgeous and practical bedroom is a number one priority for modern parents. A child’s room is a place to explore, play and rest. Bedding needs to look good, wash well and be very very cosy indeed (as much as we love those little people, an event free bedtime is always a highlight of our day!). Tigger’s bedroom is still decorated as a nursery, in fact it is exactly the same from when we originally decorated awaiting the arrival of Roo. As there are no immediate plans to re-decorate this room the addition of some ‘boys’ bedding and accessories certainly makes it feel more like Tigger’s own room. Tigger was sent a Navy Gingham Cot Bed Duvet Cover Set which as any parent of a toddler using a cotbed will tell you of the difficulties in finding good duvet cover solutions. The duvet cover is made from 100% cotton and feels much thicker than something you could grab off the high street. I loved that the pillow case was an oxford style giving it a much more grown up feel to the bedding. As the bedding is a fairly neutral set it will easily be used until he outgrows his cotbed. With our cold snap seeming to go on and on this year I was very pleased to receive the Pirate Cot Bed Quilt in addition to the duvet cover set. The flexibility of being able to add or remove the quilt depending on the weather is great. However Tigger loves to use the quilt as a playmat too, gathering up his Little People and Happyland figures so they can sent sail on a pirate adventure. I can see this quilt coming into it’s own during the summer months being Tigger’s blanket of choice overnight. Now a boy’s bedroom wouldn’t be complete without some great accessories. 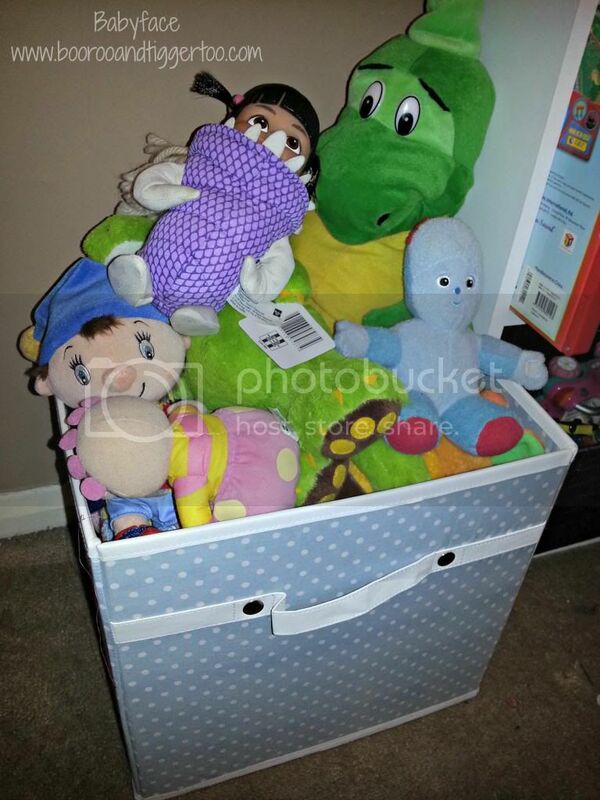 Firstly the Blue Dotty Storage Box, we are hoping to purchase some IKEA storage units and these storage boxes would find in them hiding all the toys away neatly. Until then Tigger has chosen to store all his cuddly toys in it. Secondly bunting, now bunting doesn’t just have to be to celebrate an occasion or for girls. Babyface have a gorgeous Boys Bunting which incorporates the different patterns available within their bedding and accessory ranges. 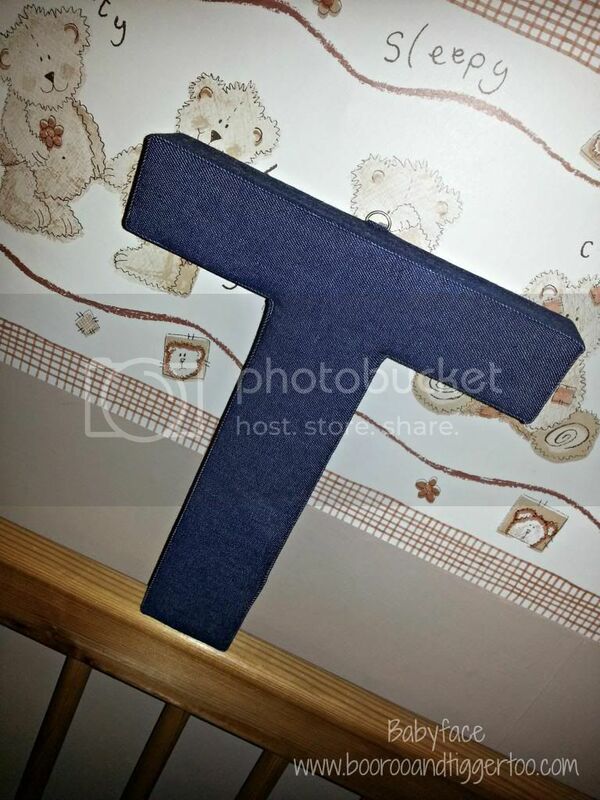 Finally fabric letters, there is something cute about these letters and come in a vary of designs, fabrics and styles. 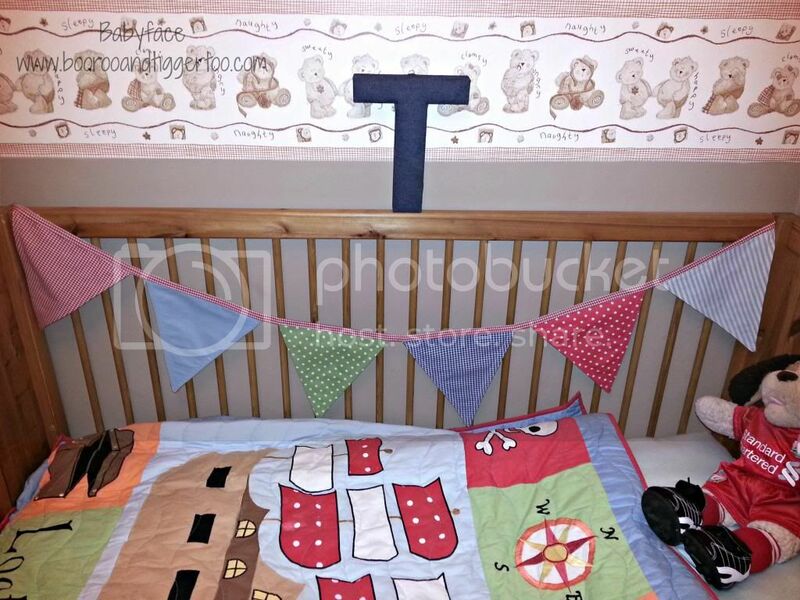 Tigger has a Denim Fabric Letter sitting on the back of his cot bed and I’d love to match this up with some of the different designs to spell out his name above his bed. I think that Tigger’s bedroom is starting to look a little more grown up instead of a gender neutral nursery, I just need to get him a nice rug and I think he’ll be good to go for a little while at least. Next challenge is Roo’s bedroom… her room is due to be re-plastered, however I have plans for how I would like her room to look once finished. With pale pink walls (we have done the in your face pink and it was a little much!) and a cream coloured carpet and possibly a wall mural now that her walls will be nice and smooth for once. I want to stick with the same bedding as Tigger’s so opting for the Pink Gingham Single Duvet Cover Set as I do think the gingham style is so cute. Along with the Pippa Single Quilt for those colder nights or summer warm evenings. Adding in similar accessories too, like the Pink Dotty Storage Box, Girls Bunting and some gorgeous fabric letters too. I really hope that Roo will be pleased with her room once all the work is all completed. How did you decided to decorate your little ones bedrooms? Disclosure: We received the above mentioned products FOC for the purpose of review.